Have you been lost before on a hike? Want an easy way to track just how much distance you’ve covered? Instead of having put up estimates, having the best GPS watch at your side does all of the work for you. These watches are some of the handiest devices any outdoors person will ever need, especially the outdoor enthusiast. With the advancement of technology, watches have become an all-around tool on top of being just a timekeeper – and this is quite true with GPS watches. These handy gadgets have a lot of features that may just go right over your head. However, instead of breezing them over and finding one with the most features, it’s important to know exactly what you’re shopping for so that you’re not wasting any money. That’s where we come in. In this article, we’re here to explain to you all of the most important features you should be keeping an eye out for when shopping. Plus, we will also provide a list of the top products on the market that you may find interesting. First stop: let’s compare the top-rated GPS watches! It is important to familiarize yourself with some of the most important features available in order to find the best GPS watch to meet your needs. It is worth learning what is available and carefully considering which features mean the most to you so that you can narrow down your options and find the one that makes the most sense for you. This refers to the specifics of the watch: how it connects to the satellite, what the screen is like and its resolution, and what operating system it’s compatible with. Pay attention to whether or not the battery is rechargeable, how long it lasts, and what other technology it utilizes as well. You will also want to carefully evaluate the screen and make sure it is big enough for you to easily see and read while active. Small screens make the watch lite enough so it feels more comfortable. 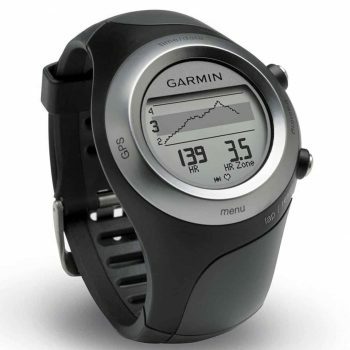 Most all GPS watches give the basic information including route, distance, and speed. More advanced features include elevation, calories burned and heart rate, where an additional chest strap is required for a heart rate reading. There are so many different functions that watches are now capable of it is mind-blowing. More advanced models are able to track a whole host of other things, such as temperature, quality of running stride and cadence, swimming statistics, depth, barometric readings, and much more. This data can be used in conjunction with online programs and software to help you chart, track and share your progress. These can be really important factors in helping you stay motivated and be aware of your progress so that you really feel like you’re making a difference in your workout or hiking journey. Other than GPS functionality, some of the other optional accessories include heart rate monitor chest straps, which may or may not be included with the watch. Foot pods can be included also, to track more information about run quality and enable the watch to work better indoors, and more. 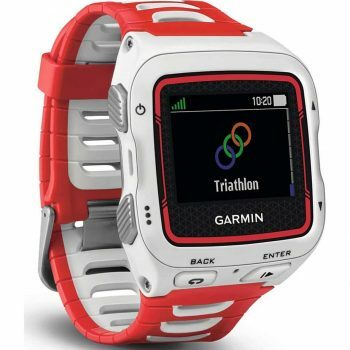 If you are simply looking for a watch to help you stay on course and keep track of your training statistics, then you most likely will not be too concerned with these additional accessories, and you certainly will not want to pay extra for them. Many GPS watches can be synced to other gadgets such as smartphones. This is accomplished by synchronizing with mobile applications, made by the brands’ developers. Most manufacturers of GPS watches will most likely create an accompanying application so users can easily sync their progress, training modules and other statistics with their mobile phones. If you have a smartphone, it would be a good idea to consider a GPS watch that you can easily sync with your device. Designed by New Balance, a name synonymous with serious running, the New Balance N9 GPS Trainer uses GPS technology to track speed, distance and pace for those who run outdoors. All in all, this is an excellent GPS watch, especially for the price. With the plethora of options on the market for GPS watches, it is easy to end up purchasing one that offers much more capability than is needed. For those simply in the market to track distance, time, and pace, this is the perfect option for you. If you seek more “bells and whistles” than you should consider other options, but you should also be prepared to pay more as well. Other great details about the watch are the fact that it is waterproof (although it will likely lose GPS signal under water) and it has a long battery life. You can expect it to last for about seven hours while using the GPS function. 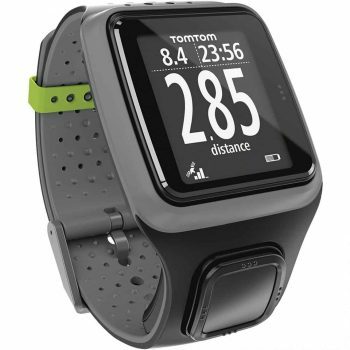 The TomTom Runner GPS Running Watch is another great choice at a very affordable price for those seeking basic GPS tracking capabilities as well as basic run data (time and pace/speed). 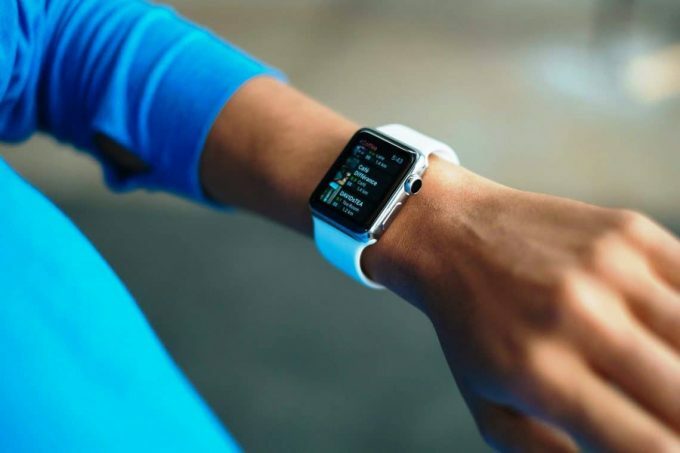 It also offers the added ability to be used in conjunction with TomTom’s app in order to upload and save data to a computer in order to track progress and help you achieve your health and fitness goals. People rave about how quickly it is able to pick up a GPS signal, no need to wait on slow technology in order to get out and get right into your run without frustration. This watch is also rather sleek and attractive, making it an ideal watch to be worn as part of your day to day wardrobe, and not just for running. Unfortunately there are somewhat limited options available as far as color and style choice, so you may not be able to choose one that best represents your personal style but there are some nice options. Other things people love about this watch is the fact that it is intuitive, easy to figure out from the get-go and easy to incorporate into your daily routine. It can also be easily integrated for use with other health and fitness apps. Related: Working out is always easier when you’ve got your favourite tunes to listen to. The Senso Bluetooth Headphones are considered to be the best wireless sports headphones in the business; there’s no cord to get tangled in, and the earbuds are comfortable and secure enough to remain in your ears, even while you’re jogging. On a single charge, they last about eight hours, and connect wirelessly to your phone using Bluetooth technology. The Garmin Forerunner 110 W GPS Watch is another excellent option for those who only need basic running watch functionality along with GPS tracking ability. 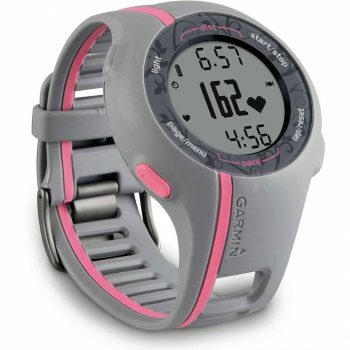 Some of the features which set it apart from other, similarly priced devices include the ability to upload data to Garmin Connect for tracking and goal-setting and sharing, as well as the fact that it cannot only be used with a heart rate monitor chest strap, but it actually has one included! Users also love how simple it is to setup and get running right from the very first use. Garmin has managed to fit all of the necessary GPS and run tracking stats all on the main display, without the watch looking cluttered or big and bulky. A few minor things users have complained about with this watch include the fact that it can take a minute or more to find satellites, even in very populated areas. Also, some have found that the charger for uploading data can be a bit tricky to get situated. These, however, are very minor complaints and do not take much away from the overall quality of this watch. Related: If you’re looking for a smart watch that has a lot more functionality and price is no object, you may want to consider the Garmin Fenix 3 HR Smart Watch. It’s capable of reading and recording your heart rate, no matter what kind of activity you’re engaged in, and feels very comfortable on the wrist with the silicone band. It’s waterproof up to 100 meters, allowing you to take this watch into the pool with you as well. In addition to basic running stats and GPS tracking, the Garmin Forerunner 15 GPS Watch also provides information about the number of calories burned. 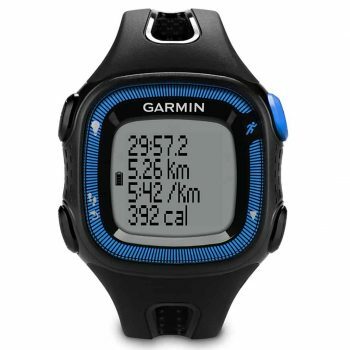 Another nice feature which sets it apart from other, comparable watches is the fact that it can also be used in conjunction with the Garmin foot pod in order to track indoor distances, since many GPS running watches are only suited for outdoor running. This watch keeps it simple and provides the information you need in a compact package. Some have complained that it can take a little time to connect to GPS Satellites, but once it does connect is stays locked in very well, and doesn’t lose signal, even during bad weather and rain. 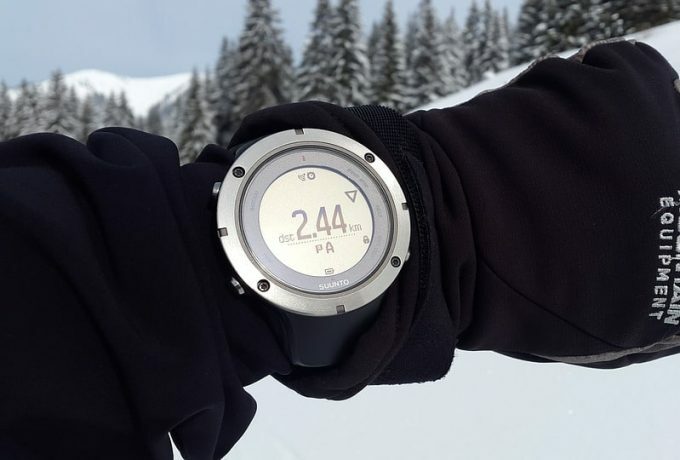 This watch also includes a heart rate monitor strap, although it comes in a standard size which many women and smaller individuals have found to be too large. Related: Whether you’re running, jogging, or walking, you need your feet to be comfortable. You could invest in Saucony 6-Pair Performance No-Show Socks to ensure the comfort of your feet. These socks wick moisture away, having padding and provide support where you need it the most, and prevent any chafing between your feet and your sneakers, allowing you to keep moving for much longer. The Garmin Forerunner 405 GPS Watch is a highly accurate GPS watch that also includes all of the necessary training features you would want, as well as a variety of extra features to help you train and track progress. It also comes with a heart rate monitor strap for even greater accuracy and ability to track calories burned. All features are intuitive and easy to access through the touch bezel that lets you easily review the stats you need without slowing down your run. It is also easy to upload data to Garmin Connect in order to view details of your run, track progress, set goals, and so much more. Although the bezel is designed for ease of use and access, many owners of this watch have found it to be frustrating because it can act up a bit when it becomes slightly damp from use or in humid weather. A simple solution to this problem is to just lock the bezel in place before beginning your run. Related: It can be difficult to always find the right charger for your GPS watch, but the Garmin USB Charger takes care of everything for you. Just clip it onto your watch, stick the USB into your computer, and it’s charging within seconds. That charger doesn’t take up a lot of space and makes it easy for you to charge it anywhere, even if you’re at work. OS compatibility: iOS, Android, Windows phones. The Garmin Forerunner 920XT Watch comes jam-packed with all of the training, tracking, and connecting features you could ever dream of, plus so much more. Although it bears a higher price tag, if you are a runner who is doing serious training or just need extra motivation to keep working toward your goals, then this is the watch for you. Aside from staying connected to your goals and feedback about your training, this model also lets you stay connected to friends and family. It can give you notifications of texts, calls, emails and calendar events, and allows you to share your workout results in real-time. People who own this watch praise it for performing flawlessly during running, cycling and swimming activities. With so many unique features and functions, one might expect this watch to be large and bulky, but that is not the case. It is slim, lightweight, and attractive. Although the watch comes with a higher price tag than a more basic GPS model, when you see all that it has to offer, you will quickly realize it’s a small price to pay for all that it can do. Related: Wear and tear is inevitable when it comes to wearing a GPS watch. Sweat, friction and the elements can really do a number on the wrist band, so having the Garmin Forerunner 920XT Replacement Bands is really a lifesaver. You won’t have to buy an entirely new watch, and it’s just as comfortable as your old band. They’re also available in several colours, so you can also pick a new band to match your sense of style. 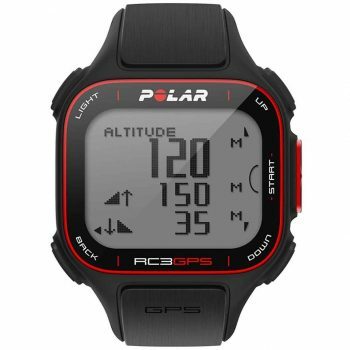 The Polar RC3 GPS Sports Watch offers everything you would expect in a good GPS/ running watch, including the ability to monitor pace, speed and route, with the added benefit of some really great online training tools to help you track and monitor your progress. People who own this watch appreciate how easy it is to sync to their computers. All you have to do is make an online account, and then you will be able to view and store all of your results online and get helpful training and tracking information, whether you’re using a Windows or Mac computer. Just connect the USB device, and all your data is ready to go. 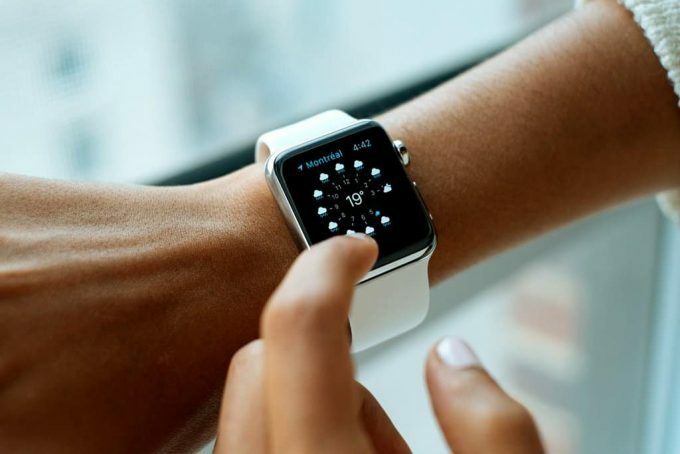 All in all, this is a great watch but there are a few complaints regarding how long it takes to connect to GPS satellites, as some users have found it to take at least two minutes or even longer to connect. Some have also complained that the watch band can be difficult to put on, but once it is on it does stay in place well. Related: Maybe you’re not invested in the long haul about tracking how far you’ve gone, since you want something cheaper at your side while you’re out walking or hiking. The Lippo LCD Step Counter is a simple and affordable device that can be clipped onto your backpack or the belt loop of your pants, and records how many steps you’ve taken that day. That ends our reviews. We have explained some of the most important features to consider, and reviewed some of our top choices for GPS watches. As you can see, there is quite a range of options for GPS watches that span from the basic to those which can give you more information about your activity than you likely ever thought possible. However, we hope that this article has helped you to narrow it down to the ideal GPS watch that is right for you. We would love to know your thoughts about GPS watches. Have you used one before? If so, which features are most important to you, and has it made a difference in your activity level and motivation? Let us know in the comments below. Camping Life Hacks: Who Says It Can’t Be Hassle-Free?